Goats: part 1. In the last blog, I mentioned our six month stay in one of Caroline’s gites, where she had a mixed flock of free range chickens and a couple of goats. Apparently, the goats came with the property when they bought it, so she ordered a book on goats from Amazon to learn what to do with them. The first words she read in the book were (something like) “if you’ve bought goats to keep your grass in trim, you’ve bought the wrong animal, you should have bought sheep”, which strikes me as a really negative way to start a book about goats, no matter how true it might be; there are softer ways of breaking bad news. Gabrielle has never been that enamoured of goats, something about their eyes, she says, perhaps subliminally connected to devilish symbolism from medieval times. In my Dictionary of Symbols (Tresidder, 1999. p92) I read that, on Judgement Day, “Christ is to divide [the goats] from the sheep and consign them to everlasting fire”; so if, on the Big Day, you fail to make the cut at the Pearly Gates, you can presumably console yourself with tasty barbequed goat. Goats are browsers and need a certain bulk in their diet which grazing just on grass won’t satisfy. I sold my petrol strimmer last year, re-investing the money in a beautiful Austrian scythe but having a mobile living strimmer seems even more permaculture and when we were offered a pygmy goat for free, I started to get very excited and even Gabrielle warmed to the idea. We placed an order for a female pygmy goat for essential company (it really is most unkind to keep farm animals in solitary confinement) and, the day after paying our deposit, were offered even more goats (see Part 2). 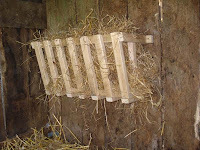 I looked around agricultural suppliers on the Internet to find designs and dimensions of hayracks and then built one for the cost of just a few screws, with some beautiful ash wood donated by our neighbour Kysinia. 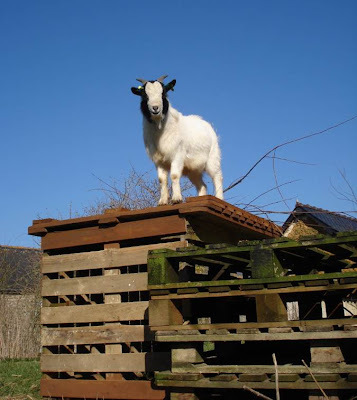 I mounted it under cover from the weather inside the field shelter and then, with yet more free non-reusable pallets from our pig-farming neighbour Paul, I built a wooden mountain, for the goat to jump around for fun. After two days alone, with the hope that the goat would get used to us more quickly, we’ve introduced our castrated Ouessant ram lamb into his paddock for company, until his girlfriend arrives at the start of April. 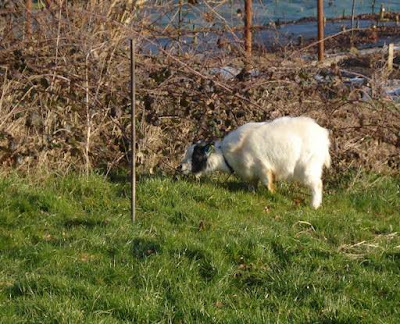 The goat spends the day out on a tether and is then returned to his paddock to run around freely. It’s early days but our permaculture plans seem to be working, as the photo below shows him getting tucked into a bramble patch. Inevitably (for me, that is) I also bought a book on goats: keeping a goat on a tether is, I read, “not recommended”. “The smaller goatkeeper (I’m nearly 6 ft tall, whereas Gabrielle is only 5 ft 2 ins, so how does this apply to us?) would not be wise to consider buying a male of any age …” It also advises disbudding (so horns don’t grow) all goats to avoid injury to human goatkeepers. So, keeping our male, horned goat on a tether is breaking all the rules. In conclusion: I recommend buying a goat ... I'm not so sure I'd recommend buying a book on goats! Please follow up in a while -- I'm really, really interested to know how the tethering works out, since I'm contemplating getting a couple of goats in to clear Brambles, weeds and some weed-trees, and tethering really is the only practical option for confining them. OTOH I've read the same stuff as you, saying "It can't be done". John Seymour, in particular, has it down in the "impossible" category... and he's right about too many other things to ignore. Tethering goats is actually rather cruel if not handled very well! The reason is that goats are very clean animals and unlike cattle and sheep cannot bear to eat anywhere near where they have, walked a lot, defecated or had a wee. They are also browsers not grazers BUT need a terrific ammount of bulk feed, probably more than a cow or sheep for its size ratio and this is where the teathering problem lies! The goat will only eat around the perimetre of its tether, unless really desperate and to make up the bulk they desperatly need will often be tempted to eat things quite unsuitable such as clothing or paper.........this is where the goats reputation for eating odd items comes from as to most people eating the washing instead of the apparently juicy green grass seems strange but the goat would rather eat that than 'dirty' grass!! Also goats are not waterproof unlike other farm animals as they have no oil in their hair just like humans, and in the wild they would take shelter in a cave or under a rock overhang therefore if not provided with a portable shelter along with the tether cannot take refuge from the rain/snow/wind!Also they cannot get away from attacking dogs! Goats also strangle themselves and break legs on tethers :-( I have seen/been called out to some terrible accidents. I don't want to be a doom and gloom merchany, just comes from having a lot of goats from 1982 - 2002! I started with a tethered goat too and most of us do....she nearly died of starvation on a paddock full of grass and scrub due to my lack of knowledge at the time! A running tether works much better and details can be found on line in several places. It is very important not to go out and leave the animal teathered! 3-4 strands of electric fencing on moveable plastic posts with bare wire preferably, works very well with goats so long as the fencer is a 12v and gives a good kick. To clear land this way just use slasher or strimmer to clear a path for the fence, put it up, put in a temp shelter a bucket of water and off they munch. When they start to look bored move the whole enclosure along a bit and strim/slash whats left! Horns.....if possible disbud kids, they must be done before 5 days old as their horn/skull structure is totally different to calves. I know a person who lost the sight in an eye due to his goat inocently throwing back her head and getting him in the eye! Hope that is helpful! Thanks for your comment, which I was going to answer buy posting a supplementary blog, Goats - Part 1 b perhaps. In fact, Val, a freidn of ours and experienced farmer based in Somerset has given you a pretty comprehensive answer. So far, and we've only done it a couple of times, we take the goat out of his field and tether him next to where we are working, so he has company and we can keep an eye on him. We are frequently working outside and today I spent a day in the woods and plan, in the future, that he will accompany me and be tethered next to me while I work, so I hope I can avoid most of the problems Val mentions. The goats I used to milk when the farmer across the road went on holiday were on tethers, but extremely long ones. They gave lots of milk at the end of the day- but, thing back, it does seem a bit cruel. "Hello, Riley's the name- I've getten a goat wi' a ripped pap!"... pause.... " Aye, like a stuck pig!" Our friend has kept a male goat for some 10 years on a tether and has not had any problems. He moves the goat every few days to a fresh patch of grass. Even in harsh winters I've noticed the goat standing outside in the cold rain/snow despite his shelter being a couple of steps away! I don't know what the conclusion is (I have to say I don't know the slightest thing about goats)... just thought I'd share! Thank you for the valuble info, I have been gathering info on how to possibly tether my goats in a 3 acre pasture full of brom and prairie grass that they LOVE and is so healthy for them. Its what I have in the feed barn! Its free if I can let them forage, my girl goats have 2 acres of forage but my boys have some gates they can get through so until fixed (husb deployed) this was helpful info as to how I can safely and KINDLY tether my sweet goats that we adore!